The city of Kanazawa (pop. 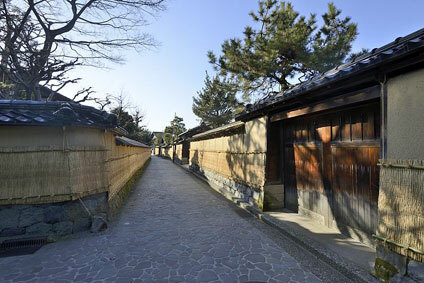 439,000), sitting in between the Sai and Asano rivers, started its history about 500 years ago, when the Ikko sect of Buddhism established the Kanazawa Gobo temple on the site of the present castle, creating Japan's only independent Buddhist state in history. 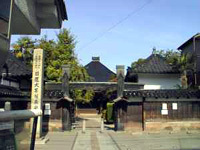 Oda Nobunaga sacked the place in 1580, and installed one of his retainers, Maeda Toshii, as the town's new lord in 1583. The Maeda clan subsequently enjoyed the largest daimyō domain in Japan until the Meiji Restoration of 1868. During the Tokugawa rule, the castle town of Kanazawa rivaled Kyōto and Edo in wealth and splendor, and was Japan's fourth largest city. Nowadays, with a population of 440,000, Kanazawa only ranks 32nd (see cities' population listing), and has turned into a kind of backwater, far off the shinkansen line joining Kyushu to Northern Honshu. Kanazawa castle took fire in 1881, and the current castle is a reconstruction, except the Ishikawa Gate which dates from 1788. 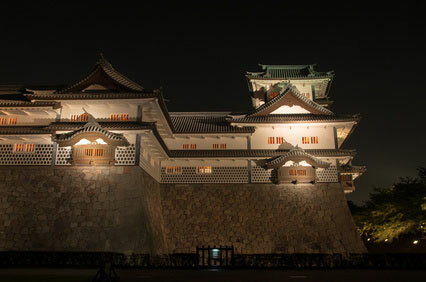 Note that the castle tower has not been rebuilt after 1881, as Japan's feudal era was over. 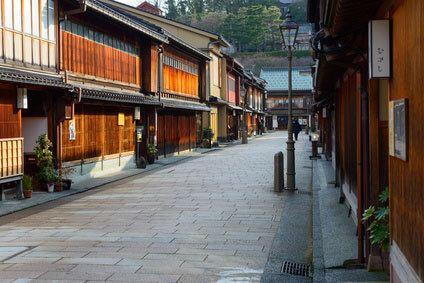 The city was spared bombing during WWII and for this reason is one of the best preserved traditional town in Japan. Kenrokuen is one of Japan's three most beautiful traditional gardens. One of the largest castles in Japan. Remarkably preserved old streets. 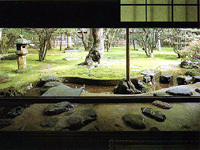 Visit the houses of samurai and geisha and a ninja hide. 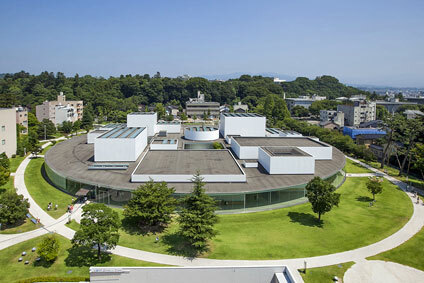 Plunge into one of Kanazawa's numerous museums and discover anything from contemporary art to Noh Theatre, the tea ceremony or traditional crafts. There are several ways to reach Kanazawa from Tokyo by train. The first possibility is to take the shinkansen bullet train until Maibara (米原) and to change to the JR Shirasagi Limited Express bound for Kanazawa. The whole trip takes approximately 4 hours 20 minutes (￥15,550). You can do the same journey via Nagoya instead of Maibara, but this will take an extra 40 minutes. An alternative route is via Niigata prefecture, passing through the Japanese Alps. Take the shinkansen to Echigo Yuzawa (越後湯沢) station, then change to the JR Hakutaka Limited Express to Kanazawa. This combination takes about 4 hours and is slightly cheaper (￥12,700). Coming from Kyōto, take the JR Thunderbird Limited Express. The journey to Kanazawa takes about 2 hours 15 minutes (￥6,700). From Nagoya you can either board the direct JR Shirasagi Limited Express to Kanazawa (3 hours, ￥6,620) or take the slightly faster route through Maibara (2 hours 30 minutes, ￥7,800). The nearest airport is Komatsu (55 minutes by bus). JAL has flights from/to Tokyo (Haneda) and Okinawa, while ANA has flights from/to Sapporo, Sendai, Tokyo (Haneda) and Fukuoka. 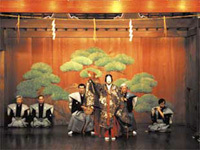 Noh theatre picture by courtesy from the Japan National Tourist Organization. Seison-kaku picture by courtesy of Kanazawa City.